William Beattie "Big Chief" Feathers (August 20, 1909 – March 11, 1979) was an American football player and coach of football and baseball. He played college football and college basketball at the University of Tennessee. He starred as a halfback from 1931 to 1933 for the Tennessee Volunteers football team led by head coach Robert Neyland. Feathers was a consensus selection to the 1933 College Football All-America Team. In December 2008, Sports Illustrated undertook to identify the individuals who would have been awarded the Heisman Trophy in college football's early years, before the trophy was established in 1935. 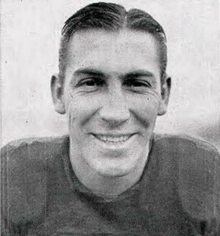 Feathers was selected as the would-be Heisman winner for the 1933 season. Feathers played professional football in the National Football League (NFL) with the Chicago Bears, Brooklyn Dodgers, and Green Bay Packers from 1934 to 1940. In his rookie season of 1934 he became the first player in NFL history to rush for over 1,000 yards in one season. His average of 8.44 yards per attempt that same year remains an NFL record (minimum 100 carries). Feathers was inducted into the College Football Hall of Fame as a player in 1955. He was inducted into the Virginia Sports Hall of Fame in 1981. ↑ Mike Beacom (December 12, 2008). "Who would have won the Heisman from 1900-1934". Sports Illustrated. ↑ "Infographic: NFL on Wednesday". Profootballhof.com. February 7, 2010. Retrieved September 6, 2012. ↑ "Texas Tech Official Athletic Site: 2008 Baseball Media Guide". Texastech.cstv.com. Retrieved September 6, 2012.